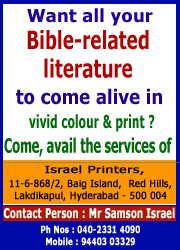 It kick-started in my own local Church namely Christian Fellowship Church, SR Nagar, Hyderabad on 15th Aug, 2009 and then it moved to Vizag on 10-10-09. Yes, by the God-given inspiration, yet another seminar on the Book of Revelation (the last book in the Bible and very relevant to the times, we live in) was held in Vizag Christian Assembly on 10th Oct 2009, thanks mainly to the initiative taken in this regard by Sister Anitha Aidayantz, the Prinicipal of Bethany School (the Church meets in the premises of the said school). It was well attended, with participants numbering up to 100. In the said seminar, which began with enthusiastic praise and worship time, there was a 7-hour power point presentation on the Book of Revelation by yours truly. http://www.jandsmministries.com/rev_pre.asp) there was a video film also encapsulating all the points covered. Needless to say, the said programme was interspersed by tea breaks and a lunch break. The response of the participants at the end of the said programme when they confided that the they could now understand the Sovereign God’s great plan for mankind in the most confounding Book in the entire Bible was a reward in itself for all of us, who organized this programme.